CO2(R744) was one of the first refrigerants used back in the mid 1800s through until the 1920-1930s. It was then phased out in favour of the newly developed CFC refrigerants. Due to the discovery of the damaging effects of CFC & HCFC refrigerants on the Ozone layer, the New Zealand Government signed the Montréal Protocol in 1987 to phase out all CFC & HCFCs ( i.e. R12, R22, & R502). HFC refrigerants were then adopted as the new norm in the mid 1990s (i.e. R134a, R404A etc. ), however HFC refrigerants have since been found to have high Global Warming Potential (GWP). So, CO2has recently returned to vogue due to it being natural, efficient, and having a very very low GWP. With the introduction of the Emissions Trading Scheme (ETS) and levies on HFCs, interest in CO2 as now being a viable alternate refrigerant is growing rapidly. Some European countries have banned the use of HFC refrigerants already. Other natural refrigerants used in refrigeration are Ammonia NH3 (R717) and Propane HC (R290), but they are not favoured in Supermarket use due to high Health and Safety risks (with Propane being Flammable, and Ammonia being Toxic) especially with most supermarkets being located in populated areas. As more and more systems are installed, component suppliers are enabling economies-of-scale and introducing better components and controls, as well as maximising the energy potential of operating a CO2 system. A Transcritical system is 100% CO2, so only one gas is required on site and it operates on a Direct Expansion cycle for both LT and MT applications. It's future is secure and it won't be phased out as other refrigerants have been in the past. It is the environmental choice for many refrigeration system applications. As more and more systems are installed and equipment supplier technology increases, the perception CO2 is only viable for large stores decreases. 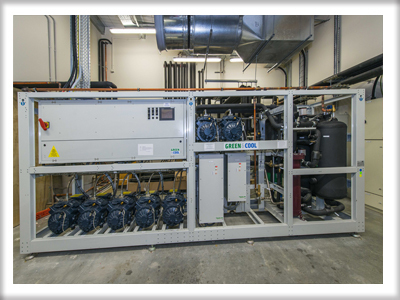 CO2 is now being used in domestic HVAC and Heat-pump DHW applications so is becoming more viable for all store sizes. In summer ambient conditions the efficiency gains are reduced and, in some instances negated, compared to traditional HFC systems. Special care in design needs to be made by experienced designers to avoid high energy costs, predominantly through smart control algorithms and additional control componentry. Transcritical CO2 is currently not recommended for warmer climates in the sub-tropical regions because of this. What do I do if .....? I currently have CO2 in my store? Contact your nearest McAlpine Hussmann Service Branch to ensure that you are getting the best efficiencies out of your system. I'm looking to upgrade my store? Contact your nearest McAlpine Hussmann representative to discuss options and guide you through the best solution for your current and future needs. I want to see Transcritical CO2store system? Contact your local McAlpine Hussmann representative.